The Evason Phuket & Six Senses Spa is located at Rawai Beach on the south eastern side of Phuket Island. 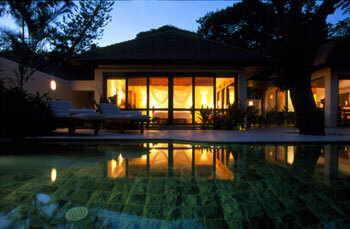 It is set amongst 64 acres of beautifully landscaped tropical gardens, facing the Andaman Sea. Travelling time from the airport is 55 minutes, Phuket town 20 minutes and 25 minutes to Patong Beach (the Night life area of Phuket). The Resort embodies the Evason philosophy of redefining experiences, and as such presents a refreshing reinterpretation of a five star resort designed to appeal to today's more sophisticated travellers. Guest Rooms, Suites and Pool Villas feature a fresh and unconventional design, which is entirely new for Phuket. Most rooms have bright, open-style bathrooms so as to create more space and light in the room. A totally new approach to materials, finishes and colours contribute to a refreshing new holiday experience. Evason service standards ensure great attention to detail and a welcoming and friendly atmosphere. It is the delivery of the service that differentiates The Evason approach from other top Resorts. The resort has 260 elegantly appointed rooms dispersed amongst 5 low rise buildings in a tropical garden setting, including 1 Honeymoon Villa at Bon Island. Most guest rooms are facing the sea with the remainder offering bay views along the coastline. All rooms have either king or twin beds with light comfortable duvets rather than the traditional blankets, most with an open-style bathroom and all with private balconies. Most room have a large daybed designed as a sitting area during the day and easily made up as a third bed at night. The Evason Deluxe Rooms feature a unique design with a large king bed placed in the middle of the room in front of an open island style bathroom featuring separate shower and bathtub, plus double vanity basins. * Large range of on-land and non-motorised water-sports activities as well as special activities for "rainy days"
Evason have always placed quality dining at an affordable price high on the list of guest facilities, and the resort has a number of options that will appeal to all tastes. This is our main restaurant serving an American and Asian breakfast buffet. For dinner we have an A La Carte menu with international dishes available. We also host buffets every evening with either an Asian, International or European flair. Live entertainment every evening. A sea view restaurant offering Thai specialties and creations by our Executive Chef from various regions of Thailand. The restaurant also features a walk-in wine cellar where you can select your favorite wine for dinner. A selection of musicians will entertain you every day of the week. Closed on Tuesdays. Located just below “Into Thai”. Into the Med is our fine dining experience where you can enjoy regional Mediterranean influenced cuisine with a contemporary twist, using ingredients and influences from Spain, France, Greece, Morocco and Italy. Into the Med is hosted by our resident Sommelier who will recommend a selection of wines to compliment your culinary experience from a comprehensive wine cellar with over 300 bins. Offers unmatched views of the ocean and the surrounding islands from its location next to the water. The restaurant and bar offer a selection of casual fare, including gourmet pizzas and a variety of tapas to enjoy with your drinks. A 15-minute boat ride by long-tail boat brings you to Bon Island and its unique scenery, with 140 metres of private beach amid a tropical environment. The cuisine is predominantly Thai served native style, and some popular European dishes plus a BBQ station. This casual beach restaurant is open for lunch only but can be booked for functions or special dinners. The lobby lounge at the main entrance is a relaxed and quiet seating area, the perfect place to unwind with a freshly brewed coffee, delicious cocktails and canapés. Here you will also discover our wine cellar with its spectacular selection of wines from around the world or book your wine for dinner at any time of the day or have it delivered to your room.